The White House said similar activities had been seen before the nerve agent Sarin was allegedly dropped on rebel-held Khan Sheikhoun in April. Syria's government denies it is preparing a chemical attack. Syrian President Bashar al-Assad has previously said the Khan Sheikhoun incident was fabricated. What does the US claim? On Tuesday, Pentagon spokesman Capt Jeff Davis said activity had been spotted at the Syrian army's Shayrat airfield, from where the US says jets departed before the Khan Sheikhoun incident. "This involved specific aircraft in a specific hangar, both of which we know to be associated with chemical weapons use," Capt Davis said. In a statement on Monday, White House spokesman Sean Spicer said the US had "identified potential preparations for another chemical weapons attack by the Assad regime that would likely result in the mass murder of civilians, including innocent children". He added that if "Mr Assad conducts another mass murder attack using chemical weapons, he and his military will pay a heavy price". The White House provided no supporting evidence or further explanation. US media had reported that the state department and Pentagon were caught off-guard by the statement, suggesting they were not consulted in advance, but the White House later said all "were involved in the process from the beginning". The US permanent representative to the United Nations, Nikki Haley, also warned Russia and Iran - Mr Assad's allies. "Any further attacks done to the people of Syria will be blamed on Assad, but also on Russia & Iran who support him killing his own people," she tweeted. The Associated Press news agency cited a non-governmental source with close ties to the White House as saying that the US had received intelligence that Syrian government forces were mixing precursor chemicals for a possible Sarin attack in either the east or south of the country. 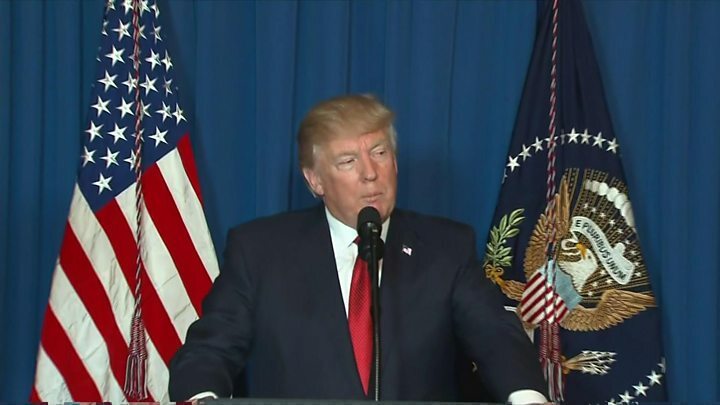 Media captionTrump: "Assad choked out the lives of helpless men, women and children"
More than 80 people were killed in Khan Sheikhoun on 4 April, according to the local opposition-run health directorate. Video posted following the alleged air strike showed people struggling to breathe and foaming at the mouth - symptoms consistent with nerve agent poisoning. President Assad's close ally, Russia, said an air strike had hit a rebel depot full of chemical munitions and released toxic agents into the air - a claim that rebel factions and the Western powers which back them have dismissed. The Organisation for the Prevention of Chemical Weapons (OPCW) has said tests on samples collected from victims indicated that they were exposed to Sarin or a Sarin-like substance. 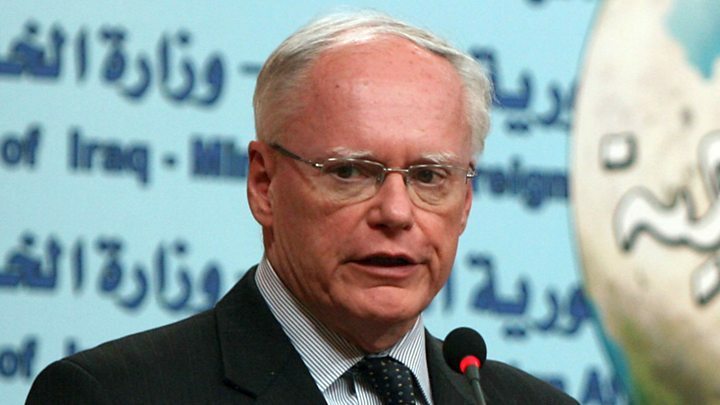 Media captionFormer US deputy national security adviser James Jeffrey says "it's high time President Assad learns a lesson"
President Trump cited the pictures of children in distress as one of the reasons he had decided to reverse previous US policy on Syria and launch a direct attack on Shayrat airbase days later. Why was Syria's Shayrat airbase bombed? 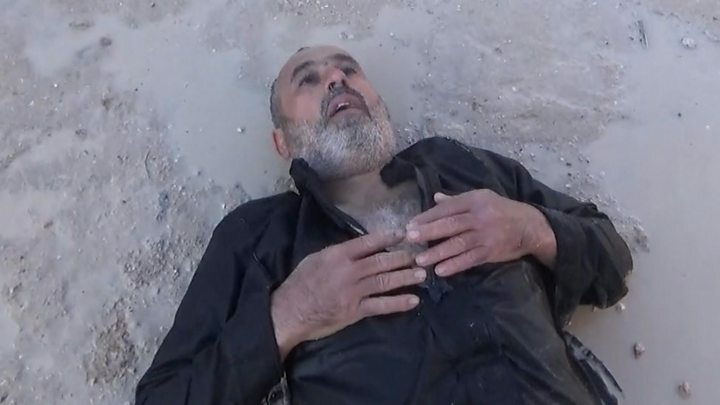 At the time, Capt Davis, the Pentagon spokesman, said Shayrat was used to store chemical weapons, and that US intelligence assessed that aircraft from there had dropped bombs filled with a nerve agent on Khan Sheikhoun. The warning is clearly intended to forestall such an attack and to make it clear that if the Syrian regime again crosses this line - just as it did last April - the US will respond with force. Speaking to AP on Tuesday, Ali Haidar, the Syrian minister for national reconciliation, dismissed the US allegation. Russia, meanwhile, said it considered "such threats against the Syrian leadership to be unacceptable". Kremlin spokesman Dmitry Peskov criticised the White House's use of the term "another" chemical weapons attack, pointing out that there had been no independent investigation of the Khan Sheikhoun deaths. President Assad has denied ever using chemical weapons and maintains that the country's entire arsenal was destroyed as part of a deal brokered by the US and Russia after a deadly Sarin attack on rebel-held suburbs of Damascus in 2013. The latest development comes amid increasing tension between the US and Russia, which recently warned the US-led coalition fighting so-called Islamic State that it would view its aircraft as targets after a Syrian military jet was shot down.